Hand cannons first saw widespread usage in China sometime during the 13th century and spread from there to the rest of the world. In 1287 Yuan Jurchen troops deployed hand cannons in putting down a rebellion by the Mongol prince Nayan. The earliest artistic depiction of a hand cannon – a rock sculpture found among the Dazu Rock Carvings – is dated to 1128, earlier than any recorded or precisely dated archaeological samples, so it is possible that the concept of a cannon-like firearm has existed since the 12th century. The oldest extant hand cannon bearing a date of production is the Xanadu Gun, dated to 1298. The Heilongjiang hand cannon has been dated to no later than 1288, but this dating is based on contextual evidence; the gun bears no inscription or era date. Other specimens also likely predate the Xanadu and Heilongjiang guns and have been traced back to the Western Xia period, but these too lack inscriptions and era dates. The earliest reliable evidence of hand cannons in Europe appeared in 1326 and evidence of their production can be dated as early as 1327. The first recorded use of gunpowder weapons in Europe was in 1331 when two mounted Germanic knights attacked Cividale del Friuli with gunpowder weapons of some sort. By 1338 hand cannons were in widespread use in France. During the 14th century the Arabs seem to have used the hand cannon to some degree. Cannons are attested to in India starting from 1366. The Joseon kingdom in Korea acquired knowledge of gunpowder from China by 1374 and started producing cannons by 1377. In Southeast Asia Đại Việt soldiers were using hand cannons at the very latest by 1390 when they employed them in killing the king of Champa, Che Bong Nga. Japan was already aware of gunpowder warfare due to the Mongol invasions during the 13th century, but cannons were not mentioned until 1510 when a monk acquired one during his travels in China, and firearms were not produced until 1543, when the Portuguese introduced matchlocks which were known as tanegashima to the Japanese. 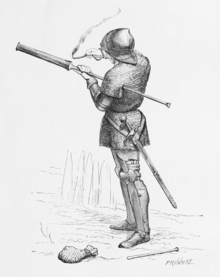 Improvements in hand cannon and gunpowder technology – corned powder, shot ammunition, and development of the flash pan – led to the invention of the arquebus in late 15th-century Europe. The earliest surviving documentary evidence for the use of the hand cannon in the Islamic world are from several Arabic manuscripts dated to the 14th century. The historian Ahmad Y. al-Hassan (2008) argues that several 14th-century Arabic manuscripts, one of which was written by Shams al-Din Muhammad al-Ansari al-Dimashqi (1256–1327), report the use of hand cannons by Mamluk-Egyptian forces against the Mongols at the Battle of Ain Jalut in 1260. However, Hassan's claim contradicts other historians who claim hand cannons did not appear in the Middle East until the 14th century. Iqtidar Alam Khan (1996) argues that it was the Mongols who introduced gunpowder to the Islamic world, and believes cannons only reached Mamluk Egypt in the 1370s. According to Joseph Needham (1986), the term midfa, dated to textual sources from 1342 to 1352, did not refer to true hand-guns or bombards, and contemporary accounts of a metal-barrel cannon in the Islamic world do not occur until 1365 Similarly, Tonio Andrade (2016) dates the textual appearance of cannon in Middle-Eastern sources to the 1360s. Gabor Ágoston and David Ayalon (2005) believe the Mamluks had certainly used siege cannon by the 1360s, but earlier uses of cannon in the Islamic World are vague with a possible appearance in the Emirate of Granada by the 1320s, however evidence is inconclusive. Khan claims that it was invading Mongols who introduced gunpowder to the Islamic world and cites Mamluk antagonism towards early riflemen in their infantry as an example of how gunpowder weapons were not always met with open acceptance in the Middle East. Similarly, the refusal of their Qizilbash forces to use firearms contributed to the Safavid rout at Chaldiran in 1514. Heilongjiang hand cannon (1287-1288). It weighs 3.55 kg (7.83 pounds) and is 34 centimeters (13.4 inches) long. The hand cannon consists of a barrel, a handle, and sometimes a socket to insert a wooden stock. Extant samples show that some hand cannons also featured a metal extension as a handle. The hand cannon could be held in two hands, but another person is often shown aiding in the ignition process using smoldering wood, coal, red-hot iron rods, or slow-burning matches. The hand cannon could be placed on a rest and held by one hand, while the gunner applied the means of ignition himself. Projectiles used in hand cannons were known to include rocks, pebbles, and arrows. Eventually stone projectiles in the shape of balls became the preferred form of ammunition, and then they were replaced by iron balls from the late 14th to 15th centuries. Later hand cannons have been shown to include a flash pan attached to the barrel and a touch hole drilled through the side wall instead of the top of the barrel. The flash pan had a leather cover and, later on, a hinged metal lid, to keep the priming powder dry until the moment of firing and to prevent premature firing. These features were carried over to subsequent firearms. The invention of corned powder, the slow match, and the serpentine lever in mid-15th-century Europe led to the development of the first matchlock firearms, which could be more effectively aimed and fired than hand cannon. Earliest depiction of a hand cannon. A figure carrying a hand cannon, with its flames and ball issuing forth. The ball is no longer extant but the sculpture bears its indentation. Dazu Rock Carvings c. 1128. Discovered in 1980, Gansu, late Western Xia (1214-1227). The Wuwei Bronze Gun is 100cm in length and weighs 108.5kg. Discovered in the ruins of Xanadu (Shangdu 上都), the Mongol Summer Palace, Inner Mongolia. The Xanadu Gun is 34.7cm in length and weighs 6.2kg. Dated to 1298. Discovered in Ningxia. This firearm is 34.6cm long, the muzzle 2.6cm in diameter, and weighs 1.55 kilograms. Reconstruction of an arrow-firing cannon that appears in a 1326 manuscript. Western European handgun, 1380. 18 cm-long and weighing 1.04 kg, it was fixed to a wooden pole to facilitate manipulation. Musée de l'Armée. The Mörkö gun is another early Swedish firearm discovered by a fisherman in the Baltic Sea at the coast of Södermansland near Nynäs in 1828. It has been given a date of ca. 1390. The Tannenberg handgonne is a cast bronze firearm. Muzzle bore 15-16 mm. Found in the water well of the 1399 destroyed Tannenberg castle. Oldest surviving firearm from Germany. A 10-shot hand cannon (handgonne), unknown age and origin. A socketed Ming hand cannon, 1505. ^ Patrick 1961, p. 6. ^ a b Andrade 2016, p. 76. ^ Andrade 2016, p. 53. ^ Needham 1986, p. 304. ^ a b Andrade 2016, p. 75. ^ DeVries, Kelly (1998). "Gunpowder Weaponry and the Rise of the Early Modern State". War in History. 5 (2): 130. doi:10.1177/09683445980050020. ^ von Kármán, Theodore (1942). "The Role of Fluid Mechanics in Modern Warfare". Proceedings of the Second Hydraulics Conference: 15-29. ^ Andrade 2016, p. 77. ^ a b Chase 2003. ^ Tian 2006, p. 75. ^ Lidin 2002, p. 1-14. ^ Partington 1999, p. 123. ^ Al-Hassan, Ahmad Y. (2008). "Gunpowder Composition for Rockets and Cannon in Arabic Military Treatises In Thirteenth and Fourteenth Centuries". History Of Science And Technology In Islam. Retrieved November 20, 2016. ^ Al-Hassan, Ahmad Y. (2003). "GUNPOWDER COMPOSITION FOR ROCKETS AND CANNON IN ARABIC MILITARY TREATISES IN THE THIRTEENTH AND FOURTEENTH CENTURIES". ICON. International Committee for the History of Technology. 9: 1–30. ISSN 1361-8113. Retrieved November 20, 2016. ^ Ahmad Yousef al-Hassan (2005). "TRANSFER OF ISLAMIC TECHNOLOGY TO THE WEST PART III: Technology Transfer in the Chemical Industries; Transmission of Practical Chemistry". Archived from the original on November 20, 2016. ^ Broughton, George; Burris, David (2010). "War and Medicine: A Brief History of the Military's Contribution to Wound Care Through World War I". Advances in Wound Care: Volume 1. Mary Ann Liebert. pp. 3–7. ISBN 9781934854013. The first hand cannon appeared during the 1260 Battle of Ain Jalut between the Egyptians and Mongols in the Middle East. ^ Books, Amber; Dickie, Iain; Jestice, Phyllis; Jorgensen, Christer; Rice, Rob S.; Dougherty, Martin J. (2009). Fighting Techniques of Naval Warfare: Strategy, Weapons, Commanders, and Ships: 1190 BC - Present. St. Martin's Press. p. 63. ISBN 9780312554538. Known to the Arabs as midfa, was the ancestor of all subsequent forms of cannon. Materials evolved from bamboo to wood to iron quickly enough for the Egyptian Mamelukes to employ the weapon against the Mongols at the battle of Ain Jalut in 1260, which ended the Mongol advance into the Mediterranean world. ^ Khan 1996, p. 41-5. ^ Khan 2004, p. 3. ^ Ágoston 2005, p. 15. ^ Andrade 2016, p. 80. ^ Andrade 2016, p. 105. ^ Needham 1986, p. 289. Needham, Joseph (1986), Science & Civilisation in China, V:7: The Gunpowder Epic, Cambridge University Press, ISBN 0-521-30358-3 . Wikimedia Commons has media related to Hand cannon (handgonne).